Reading is thinking. These three simple words are the foundation of the literacy program at San Domenico. Here, students learn to think—whether they are reading, writing, or speaking. Lessons teach strategies that encourage and empower the student to be actively involved in developing and applying expressive skills. The writing curriculum supports a process approach in which students are encouraged to use their own distinct voices. All four areas are guided by ASSESSMENT both summative and formative. This allows for best teaching and learning practices. The kindergarten literacy classroom also known as the “ABC Room” is set-up and designed to be an interactive learning environment. On a daily basis students are engaged in hands-on and multi-sensory activities. Students are surrounded by a print rich environment which include books at varied reading levels and genres. Students are taught to work collaboratively in small groups as partners and individually. After the group “mini lesson” is taught at morning circle, the students extend their learning by rotating through four literacy centers on a weekly basis. The centers vary from teacher guided to independent. The activities change weekly to support the target lessons taught each week. The five essential components of reading begins in kindergarten and continues throughout the primary grades. It is important to understand that “learning to read” is a continuum of stages that are acquired developmentally, not by age or grade level. Phonemic Awareness: The knowledge and manipulation of sounds(phonemes) in spoken words. Vocabulary: The knowledge of words, their definitions, and context. Comprehension: The understanding of the meaning in text. Reading “to” students using the “READ ALOUD” model of reading is the most important reading activity in kindergarten. This style of reading is integrated throughout the daily curriculum to include Math, Science, Social Studies and Art curriculum. Reading “with” students models and teaches “THINK ALOUD” and “SHARED READING”. Building a foundation for reading (decoding) and writing (encoding) is key to success for our Primary School students. All students in kindergarten, first and second grades will be instructed using a program called, Fundations. Writer’s Workshop: We are all Writers! Capitalization: person, places, proper nouns, & the first letter of a sentence. Punctuation: Using a period, question mark or exclamation point at the end of a sentence. San Domenico spearheaded a literacy initiative several years ago that is based on validated comprehension studies and practical teachings. These practices were communicated to the faculty through professional development opportunities headed by such esteemed literacy experts as Stephanie Harvey, Debbie Miller, and Ellin Keene. Our classroom instruction of these strategies is comprised of immersing our students with fine literature, sharing our own thinking and insights as readers, and making certain that “just right” books are placed in their hands. Our classroom libraries are stocked with an assortment of popular and classic age appropriate books that are readily available to them throughout the day. The books are sorted by genre (fantasy, fiction, non-fiction, historical fiction, informational) enabling them to make selections based on preference. We use the Lucy Calkin’s Writer’s Workshop Model. Students meet for workshop 4 times a week. We model writing strategies during the daily mini-lesson. We use mentor texts for each unit of study to guide students in the specific genre. Students work throughout the year to build their independence as writers. The children go to the library as a class once a week where library skills are reinforced. Of course, children are also encouraged to ask to use the library to check out or return books at opportune times throughout the day. A collection of phonetically decodable books that offer rich and successful reading experiences that bridge the gap between phonetic decoding and fluent independent reading. 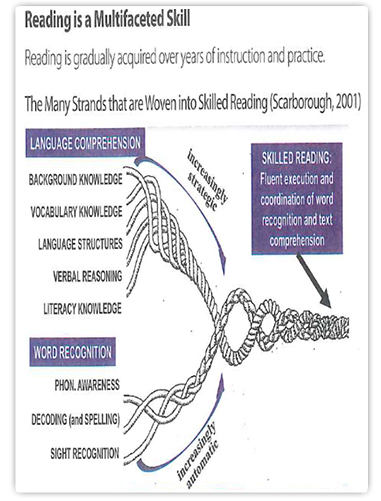 A systematic and explicit approach to reading and spelling with phonics. Explode the Code, Educators Publishing Service, Inc.
Students learn to write and speak with a command of standard English conventions appropriate for second graders. Our writing curriculum supports the writing philosophy endorsed by Lucy Calkins, founding director of Teachers’ College Reading and Writing Project at Columbia University in New York City. Fluency practice, vocabulary development, and the applications of strategies for better understanding of text. Do I understand the story? Reading is thinking... three simple words that are the foundation of our literacy program in third grade. We want our students to think every time they are engaged with print, whether they are reading, writing or speaking. To us, literacy is the love of words...the love of language...the command of language. A literate person is able to connect to the text by continuously monitoring their inner thoughts and forming a complete understanding of the story – text to text; text to self; text to world. In third grade, we write everyday. We all have a story to tell and believe that our lives are worth writing about. During the writer's workshop, we Collect entries, Choose Seed Ideas, Gather Around Seed Ideas,Draft, Revise,Edit, and finally Publish. We marinate the children in good literature and model writing strategies during the daily mini-lesson. We act as mentors and coaches for students who are learning to be powerful and independent writers. Too Easy Books - If you are answering YES, this book is probably a "Too Easy" book for you. Do you know every word? Can you read it quickly and smoothly? Just Right Books - If you are answering YES, this book is probably a "Just Right" book for you. Is this book new to you? Do you understand some of the book? Are there just one or two words per page that you don't know? When you read are some places smooth and some choppy? Can someone help you easily with this book? Who? Too Hard Books - If you are answering YES, this book is probably a "Too Hard" book for you. Are there more than one or two words on a page that you don't know? Are you confused about what is happening in some of this book? When you read, does it sound pretty choppy? Most of the time you should read "Just right" books. That's how you become a great reader! The fourth grade reading program is consistent with the other grades in the primary school in that we continue to use Lucy Calkins Reading Workshop. Fourth graders will read books selected by their teacher, as well as books they select themselves. Research has proven that the best way to increase reading comprehension is to read a lot, at the right level. Therefore, our goal in reading is to read as many books as possible at the “just right” level. This lead to students feeling comfortable choosing “just right” books at their individualized level.“Just right” levels vary among students and can change throughout the year. Making Connections: Linking background knowledge to new information by responding orally and in writing. Questioning: Writing questions down to be engaged while reading to further comprehension. Envisioning: Making visualizations in Reader’s Notebooks helps to create mental images based on what students read. This enhances understanding. Infer: Making inferences involves drawing a conclusion from information that is not explicitly stated in the text. Synthesize: Thoughtful readers deeply analyze what they are reading to make connections across texts in a variety of genres. Literature such as Kate DiCamillo’s, The Tiger Rising and Lois Lowry’s, Number the Stars are two examples of books we read throughout the year. Evaluation is determined through teacher guided reading assessments, assignments, and reviewing entries of Reader’s Notebooks. The students set goals throughout the year with the guidance of one-on-one teacher conferring and small group conferences. Are there more than three words on a page that you don't know? Are you spending too much time looking up the vocabulary? Just Right Books - If you answer YES, this book is probably a “Just Right” book for you. Are there just one word or two words on each page that you do not know? Are there some parts of the story easy to read, and some parts more difficult? *Units of study are subject to change. The 4th grade writing program is set up to prepare students for what is to come in 5th grade and middle school. Students begin to write less about themselves, and start to learn more about the structure and organization of paragraphs and essays. Students are graded on the following components of writing: structure, development, and language conventions. The topics in our reading and writing programs are closely integrated throughout the year and build upon the previous year’s foundation. Building a foundation for reading and writing is key to success for our students. We use Wordly Wise workbooks for vocabulary development of multiple meaning words and their uses.In grammar, we teach the foundational elements of the English language such as nouns, verbs, adjectives, etc. Our grammar and vocabulary program builds upon the “Fundations” program in grades K-3. The fifth grade reading program is consistent with the other grades in the primary school, using Stephanie Harvey’s comprehension strategies and DRA’s (Developmental Reading Assessments), plus other mini fluency and comprehension assessments. Research has proven that the best way to increase reading comprehension is to read a lot, at the right level. We believe that for success in literacy, it is essential that children have the correct leveled text to read. Matching the correct book to the reader places the child in the position of achieving fluent, phrased reading. Our goal is to have students read as many books at the “just right” level. Giving a child a text that is too difficult will cause frustration, and they will never achieve fluency, true comprehension or a passion for reading. Making Connections: Linking background knowledge to new information by reacting, responding and questioning. Questioning: Making meaning through asking and writing down questions while we read. Visualize: Making visualizations in our Reader’s Notebook help us create images in our mind based on what we’ve read. This helps enhance understanding. Synthesize: Thoughtful readers integrate new information with their existing knowledge to come to a more complete understanding. Students will be held accountable for keeping their reading logs up to date, and achieve their goal of 13-15 novels per trimester of “just right” books. Writing is taught four times a week, in homeroom group instruction. We use the Lucy Calkins (Writer’s Workshop) writing program. The program is set up to prepare students for what is to come in middle school. Students learn more about the structure and organization of paragraphs and essays plus research strategies. Students are graded on the following components of writing: structure, development, and language conventions. We are collaboratively working as a team to blend writing and reading across the subjects. 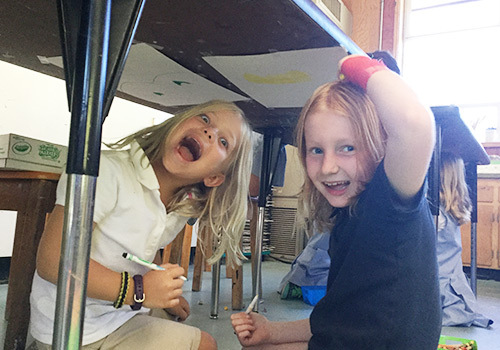 At each level, the mathematics program at the San Domenico lower school carefully balances fundamental skills, problem solving, and critical thinking. The curriculum emphasizes the process as much as the answer. This approach is supported by research, which indicates that successful mathematics students must develop both procedural proficiency and conceptual understanding. The program inspires inquiry and challenges students to recognize how mathematics can apply to real situations that are relevant in their daily lives. Our Kindergarten Math Curriculum is based on Singapore Math by Marshall Cavendish. This curriculum is an activity based, child centered, manipulative math program in which the children learn through the five senses. Children follow a sequence of developmental activities, varying between small group and independent work. The Kindergarten classroom is one in which the children are encouraged to think, explore, discover and experience. Our goal is to develop an understanding and insight into the patterns of Math through use of concrete materials. Approaches the child’s levels of understanding in a meaningful sequence, beginning at the conceptual level and passing through the connecting level to the symbolic level. (From concrete to pictorial to abstract). Surrounds the child with the math concept in many different ways. Establishes an environment that enhances self concept and social interaction. In first grade, students interact with manipulatives to construct meaning of various math concepts. Students build meaning through the use of games, interactive experiences, and collaboration with peers. Communicating their math thinking is an integral part of the daily math instruction. The year begins with an in depth study of numbers sense and number relations. Place value and addition and subtraction strategies with ones and tens. Our second grade math curriculum reviews and builds on the concepts and strategies learned in first grade. Our classrooms are transformed into investigative laboratories in which the children are encouraged to construct meaning in their own way rather than passively receive its meaning. Students experience learning in a non-threatening, exciting, and fun way through games, manipulatives, and problem-solving situations to build critical thinking. Through modeling/crafting, practice, and reflection the logic behind math is explored. This year we are excited to incorporate the Singapore Math methodology to our teaching, a curriculum aimed to help students develop math concepts and process skills for everyday life and to provide students with the ability to formulate, apply, and solve problems. Singapore Math is known to build a solid foundation in mathematics by focusing on visual understanding, the importance of making connections, the study of patterns and relationships, and the mastery of concepts that each year builds on the prior year’s foundation and extends student understanding. Concepts are taught in a concrete, pictorial, abstract progression with a big emphasis on number sense and place value. Students work towards fluency by learning and using mental math strategies. As a result, mental math skills show flexibility of thinking. Our math curriculum covers concepts that include probability, geometry, graphing, measuring, multiplication, division, estimation, fractions, money and time. Kim Sutton – Kim is a fabulous presenter with Creative Mathematics who has taught teachers the joy and excitement of “hands-on” math. Through songs, dance, and overall original and imaginative activities math becomes a fun and long lasting experience. Third grade is a big transition year in math. The third grade math curriculum focuses on hands on exploration to build a deep understanding of number sense and place value. Our curriculum reviews and builds on the strategies and concepts taught during the earlier years. The students use a variety of manipulatives, games, and problem solving skills to investigate and explore numbers. The children develop their own understanding of numbers therefore understanding the “why” before “how”. Math is taught using small group and center based instruction, which allows for individualized support. Prior to each new unit, a pre-test is assigned to allow students to recall prior knowledge on the concept. The concepts are taught using the Singapore Math methodology of “concrete, pictorial, abstract” The students explore the new concepts using concrete materials to help build a solid understanding. The students then move to exploring the concept using the pictorial stage. 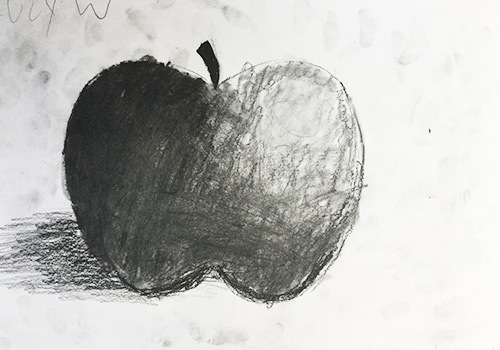 In the pictorial stage, students continue to use concrete materials as well as drawing their own meaning that may include drawing pictures; using circles, dots and tallies. The students then move to the abstract stage. The abstract stage allows the students to solve and understand the concept using abstract symbols to model and solve problems. At home please support your child's learning by using concrete measures to model the reasoning behind the computations whenever possible. Beans, buttons, popcorn kernels, cards, dice and other basic household items make perfect tactile manipulative tools to help your child visualize problems and make connections between concrete and abstract thinking. Math is taught through both small group and instruction and individual support. Throughout the year students practice, review, and reinforce problem solving and critical thinking skills. Homework is assigned primarily from the Math in Focus workbook and worksheets for extra practice. Each class begins with a mental math warm-up and correcting the previous night’s homework. After the lesson is taught, students are usually assigned work in either their textbook, specific worksheets, or online assignments. The iPads will be used for both in-class assignments, as well as enrichment for students who have completed work or show mastery of the skill we’re working on. Prior to a test, pre-tests are assigned for homework and corrected in class so that students are able to ask questions and receive help with areas of difficulty. Study skills are a very important aspect of fourth grade and students are encouraged to study for tests in advance. The key materials they are encouraged to use for study purposes are their math journal notes, chapter wrap-up, and pre-test. *This year we will be focusing on word problems using the Singapore Math “Model Drawing” strategies. This will help students better understand the various steps in solving multi- step word problems and showing understanding of what a question asks. Our math class begins with mental math activities. Students work in small groups to figure out the answers. This gives everyone a chance to work together to resolve a problem. It also helps us become more accepting of a different way to reach the same answer. We start each new unit of study with exploring activities to discover and understand the new concept. Students transfer their conclusions onto paper by creating a model or a picture. They are introduced to the abstract form of the concept only after they go through the process of both concrete and pictorial. The concepts are then solidified through workbook and textbook assignments, projects, games, and use of technology. 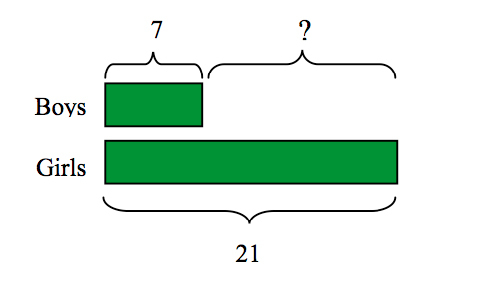 Word problems are consistently incorporated into each unit in order to challenge students’ critical thinking skills and help them apply the new concepts. We practice “model-drawing” strategies to create a picture of known facts of the word problem before solving it. Homework is assigned both daily and as family projects. Daily homework should not take more than 20-30 minutes. Students are encouraged to come back to me for help in case they have any problem with the concept. Parents may help with homework only if the student needs a little prompting with the algorithm. We prepare for our tests by doing a pre-tests and correcting them in class. Students have numerous chances to ask questions and go over the areas of difficulty both during the class and math lab. The key materials they are encouraged to use prior to the tests are their pre-tests, math journal, math vocabulary, and chapter wrap-ups. Find whole-number quotients of whole numbers with up to four-digit dividends and two-digit divisors using strategies based on place value, the properties of operations, and/or the relationship between multiplication and division. Illustrate and explain the calculation by using equations, rectangular arrays, and/or area models. Upon login, select "my library"
The Lower School Music program is designed to develop an appreciation and understanding of music through active participation.Students experience songs from American traditions as well as songs and genres from around the world.Music classes include movement, the playing of percussion and Orff instruments, as well as a weekly focus on singing. Kindergartners begin to express music by learning the skills of musicianship. We hear, sing and play music exploring different tempos, expand our range of melody, and experience loud and soft dynamics. 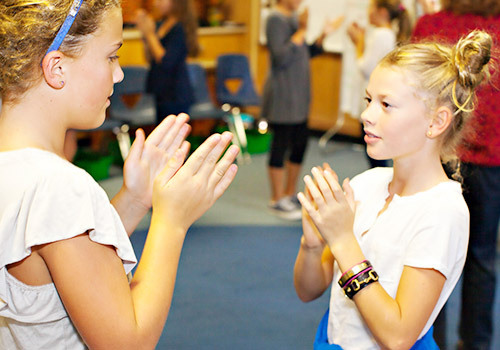 Students are exposed to many genres and given the opportunity to use movement to feel differences in beats and rhythms. We also begin singing melodies and ostinatos (repeating phrase or rhythm) together as an ensemble. In 1st grade we continue to build our use of expressive elements (more complex rhythms, tempos, and dynamics) to further enjoy participating in music. We will identify rhythms and begin playing them in simple ensembles on percussion and Orff instruments. Many songs we sing will utilize: ostinatos, rounds, echoes, call and response singing, in order to help grow musicianship. 1st Graders will begin to understand and write basic music notation. We will also begin listening and identifying different instruments and use our ears to tell us when to respond to the music. 2nd Graders expand their musicianship by: incorporating rests for more complex rhythms, singing, moving and playing new meter, and beginning to understand syncopation. We play and listen more actively and add more sections to our class ensemble. We begin to learn about improvisation and start to improvise melodies. Our voices will encounter songs with larger interval leaps, more parts and more challenges. Music reading skills will grow as we read and write rhythms and pitches. In 3rd Grade we will begin to understand and recognize song forms and use this understanding to explore the musical differences in genres and cultures. We will start to sing canons and two part harmony. Our class ensemble will expand to include accompanying harmony parts on the bass xylophone, or ukulele, to support a solo instrument like voice, or a soprano xylophone. We will continue to work on reading notation and understanding its connection to the notes we are singing, or playing. We will also participate in song-writing activities to create original music. Students engage in activities such as muscular strength, flexibility, and agility, while learning how their bodies work and how to keep healthy. Our whole child program encourages individual growth in skills and abilities. Physical education provides a venue for students to interact socially in a venue outside the classroom. With an emphasis on cooperation, community, and respect, students learn life-long social and emotional skills that will help them as they become effective citizens in the greater community. Students also enjoy myriad integrated opportunities with creative movement and dance. Our program is designed to promote scientific knowledge of the earth, life, and physical sciences, with a special emphasis on developing critical thinking skills. 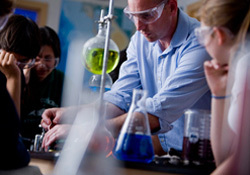 Students are provided opportunities to use the scientific method in the classroom, laboratory, and field environment the campus provides. As students design and conduct experiments, they practice the processes of observation, data collection, questioning, hypothesizing, and forming conclusions. The program fosters scientific literacy and creative problem solvers, as evident in our Science Fair and Invention Convention. Field trips are a key part of the program. To foster understanding, excitement, and appreciation of the world in which we live. To "do" science, i.e. questioning and discovering, not just covering material. Effective hands-on inquiry involves a series of steps that builds students' investigative skills. Our curriculum is designed to promote knowledge in civics, geography, and the history of the local community, state, and nation. Students examine diverse societies and times to develop an understanding of the factors that divide nations, and common qualities that connect them. Our social studies program incorporates music, art, dance, and literature to better understand the story of human events. It is is a relevant way to practice literacy, math, technology, and library skills, capitalizing on experiential learning using field trips to historical sites and observation of government in action. 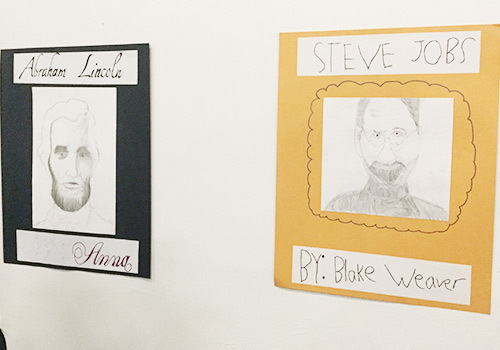 Social studies is interwoven with art in the art room as well as presented 2 times a week in the afternoon. We start the year off with the themes of family, community, teamwork, our state Thanksgiving, Native Americans, and the Festival of Light’s book (Advent, Hanukkah, Kwanza, and Los Posadas). The second half of the year we focus on cultures/ethnography and Holidays from all over the world (Chinese New Year, St. Patricks Day, Cinco de Mayo, and others). Students will explore various social studies activities through hands-on projects and inquiry based learning. Students work with a partner to create an ibook about the rainforest using the book creator app. Biographical Read-Alouds- unsung hero’s of today’s world. 3-D projects of each child’s favorite unsung hero. “Family Share” is a curriculum enriching program in which families are invited to come to class and share a tradition, story, travel, or experience that lends itself to our study of cultures, family values, traditions, geography, and world issues. Class projects: mapping project, Miwok project, etc. Students will spend the year studying the history of our state using the text, Our California by Scott Forseman. 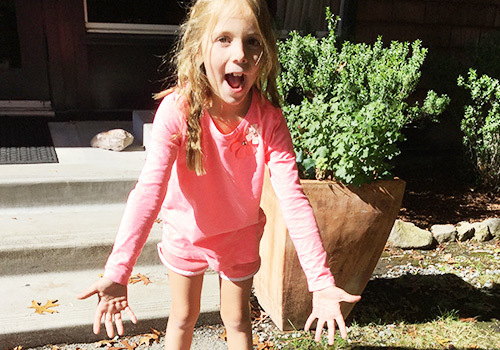 Each lesson is previewed with a video clip of new vocabulary words and a short explanation of the lesson, which connects the learning to their lives in California. The unit begins with the geography of the state and moves into the early Californians, explorers, missions, ranchos, gold rush and statehood. There are various projects and hands- on learning experiences outside the text that relate to the curriculum. In Social Studies, the fifth graders will participate in studying and creating projects based on geography and the history of the United States. There will be various fun projects and hands-on learning experiences to engage the students. At San Domenico, our Spanish program seeks to foster a desire of learning another language, and gives students the tools necessary to continue building their skills and proficiency in this lifelong pursuit. Students in the younger grades build a base of thematic vocabulary and acquire a basic understanding of the structure of language in an engaging and interactive way through project based learning and games. Students are prepared to use their knowledge towards conversational Spanish as reading, writing, and speaking. From Kindergarten to Third grade the students learn Spanish mostly orally. At this age, the children’s capacity for imitation is still very strong, and they are immersed in the language through gesture and mime, songs, verses, poems, rhymes, stories, drama and games. Students learn basic Spanish vocabulary words about colors, parts of the body, nature, animals, clothes, food, numbers, parts of the house, time, family, weather, seasons, days of the week and months of the year. In Fourth Grade, reading and writing is introduced, and students begin to apply the Spanish knowledge that they gained in previous years into the written form. This gives the students a sense of accomplishment and success, because they understand what they are learning to write. After this first step, students begin to write and read new materials and produce their own work, following examples given by the teacher. Grammar is introduced with the conjugation of regular verbs and parts of speech, and students continue learning through songs, verses, poems and stories. In Fourth and Fifth grade, the students create a digital portfolio of their work, using a variety of iPad apps, such as Book Creator. Each student makes visible his or her learning process in a variety of ways, including but not limited to: writing, speaking, recording videos, and drawing. In Fifth Grade, students continue the study of Grammar, with the introduction of basic irregular and reflexive verbs. Through the introduction of a reader, the students continue to develop writing skills with a focus on sentence formation and creating their own “stories”. Students continue building upon what they have learned in previous years, adding more detail and expanding their skills, skills which students are also developing in their 5th grade writing class. 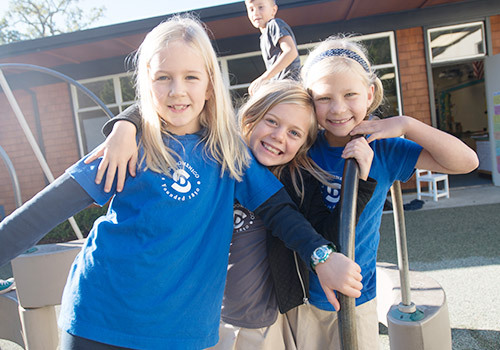 Rooted in Dominican tradition, and reflecting the school's mission to teach students of all faiths, San Domenico encourages even our youngest students to become moral thinkers as well as academic achievers. We provide a moral framework for making ethical decisions which guide personal choices and interpersonal relationships. Students apply the values they have learned within the school community and through participation in service learning projects. Our Ethics, Philosophy, and World Religions classes are centered around the four Dominican pillars of Study, Reflection, Community, and Service. 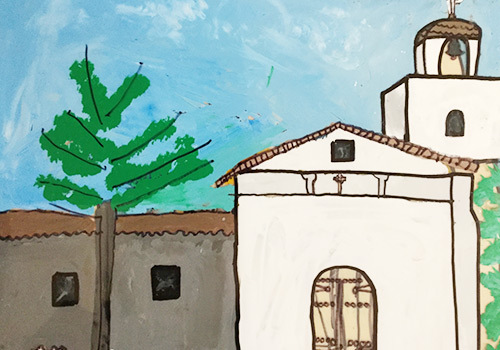 Students explore their own family beliefs and the religious beliefs of others within the Dominican spirit of inquiry, inclusivity, and interconnectedness. In turn, students strengthen and deepen their own beliefs, ideals, and conviction of self. Additionally, students develop character and integrity through reflection, social emotional learning, and community building, and they regularly engage in service and sustainable practices, responding to the needs and challenges of our time. Research shows that providing students with formal SEL raises student test scores, reduces the effects of peer pressure and bullying, and promotes feelings of well-being and resiliency. Effective Management (Teachers create a calm, orderly environment that promotes autonomy and allows students to focus on learning. Responsive Classroom beautifully complements our four Dominican pillars, and dovetails perfectly with our existing programs. Responsive Classroom allows for consistency and quality at every grade level. All of our classrooms have a “Morning Meeting,” a “Closing Meeting,” teachers all use the language of “Reinforcing, Reminding and Redirecting,” as well as a chime that gently brings students to attention, and they incorporate in-class supports such as “Take-a-Break.” For more information, visit the Responsive Classroom website: www.responsiveclassroom.org. The Second Step curriculum ranks among the most highly respected and effective SEL programs used in schools today. Students receive Second Step instruction throughout the year in the Lower School, grades K-5. (In Middle School, formal Second Step instruction continues in Sixth and Seventh grades; in Eighth grade, students participate in “Guidance” class, facilitated by the counselors and designed to discuss many of the same topics in developmentally relevant ways). Research shows that students who learn to self-regulate are better able to participate and learn in class; students who learn to feel empathy for others are better prepared to manage their own strong emotions and solve interpersonal problems; and students who learn proactive strategies to self-regulate and problem solve are less likely to engage in impulsive behavior. They are also more likely to have good relationships with peers, as well as to make good, resourceful choices. Families at all grade levels receive a welcome letter from their respective grade level Second Step teacher, including the registration code you will need to go online and make use of the wonderful resources available at www.secondstep.org. This program is most successful with parent participation and follow up at home! Our Lower School staff incorporate mindfulness lessons each day into the classroom and during weekly assemblies, including the use of "mindful moments" and listening to a "singing bowl" to learn to focus our awareness and attention. Our LS Counselor provides 8 weeks of formal instruction in mindfulness to each grade level during the year, using the Mindful Schools curriculum: the lessons teach students about what Mindfulness is, how to put on a "mindful body," take "mindful breaths," and many other simple and powerful strategies for greater focus and awareness. We annually host a LS Mindfulness Parent Coffee for families. Build Empathy & Community (leading to a happier and more inclusive school community). Mindfulness taught in the younger grades provides students with tools of well-being that they can take with them to middle school and beyond. For more information about this topic and the curriculum we use, join us for the Parent Coffee and visit the Mindful Schools’ website: mindfulschools.org. Since 2012, San Domenico has partnered with No Bully to bring additional tools for supporting students in developing healthy relationships, and for intervening when challenges arise. The No Bully System is a radically effective solution to bullying. Click here to learn more. The visual arts curriculum is cyclical: concepts are introduced, developed, expanded, and revisited. 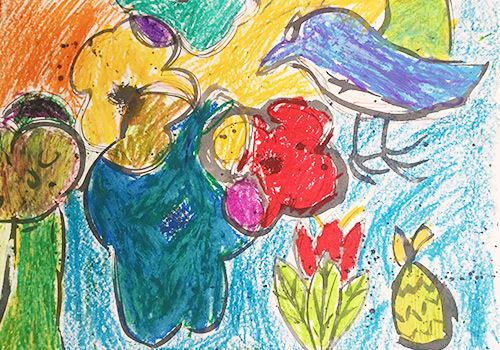 Each child is challenged to create in new directions and acquire more advanced skills—engaging in the process of art and fostering an appreciation of the arts of different periods and cultures. While mastering techniques, students discover and develop their creative talents and cognitive processes. 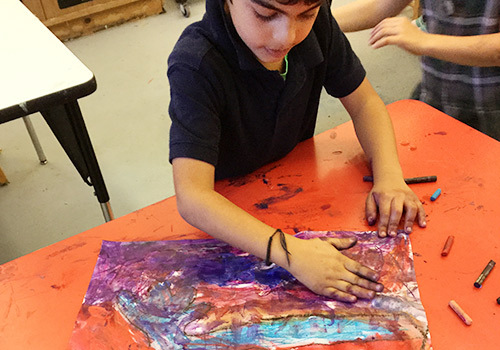 Art is also integrated into other curricular disciplines, giving students the opportunity to connect it with academic subjects. 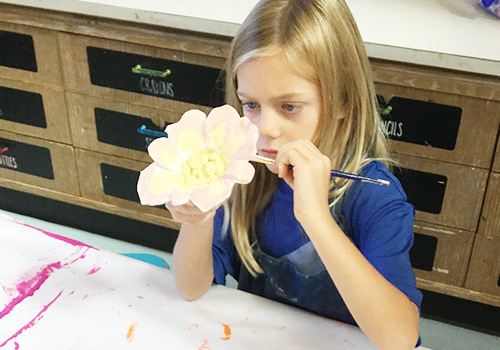 Our goal in the lower school art studio is to guide each child’s creative development and encourage individual growth throughout the year. We hope to instill independence, respect, and courage while they respond to challenges and prompts that foster critical thinking skills and unique idea formation. Every child is an artist and this special time in a child’s development is one in which we honor and protect their individual creativity. 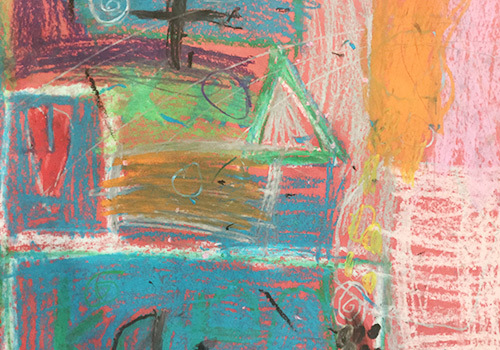 We center our work around various artists, time periods, experimenting with different media, and developing a desire and love to use art as another means of expression. 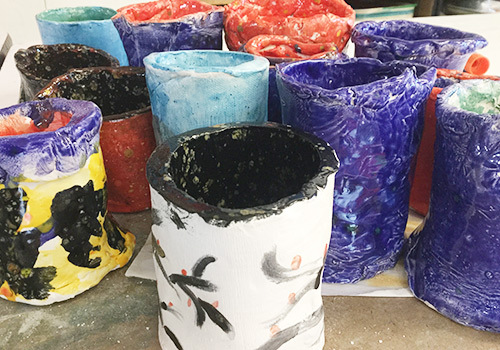 Skills, such as observational drawing and ceramic hand-building techniques, spiral and sequence from Kindergarten all the way through to grade twelve within the visual art department. 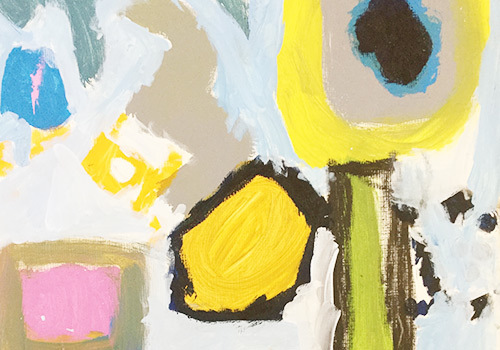 In Kindergarten, we will paint like Kandinsky while listening to Stravinsky, use Vincent van Gogh’s Starry Night for inspiration, draw with a scissors like Matisse, make pinch-pot and slab ceramics. Some of the media we will experiment with are crayon, tempera paint, printmaking, oil pastel, and watercolors. Integrating art with other areas of the curriculum is an important part of the art department as we strive to give students another entry point in understanding the world. Another purposeful part of the art program is the time, place, and community provided to the students for ‘play’ with art materials. This important opportunity allows kids to freely experiment and use their truly unique and individual ideas to stretch their minds. 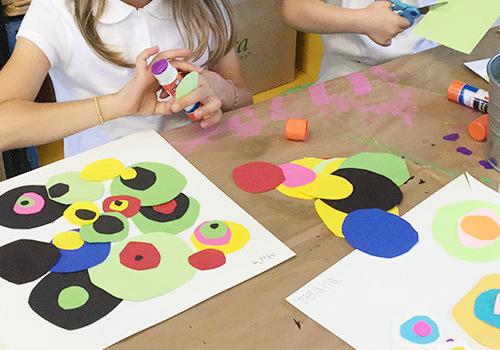 In First Grade, we will explore Earth Art and Andy Goldsworthy, look at Gustav Klimt and his patterns, use George Seurat’s pointillism for inspiration, make pinch-pot and slab ceramics. Some of the media we will experiment with are crayon, tempera paint, printmaking, oil pastel, and watercolors. 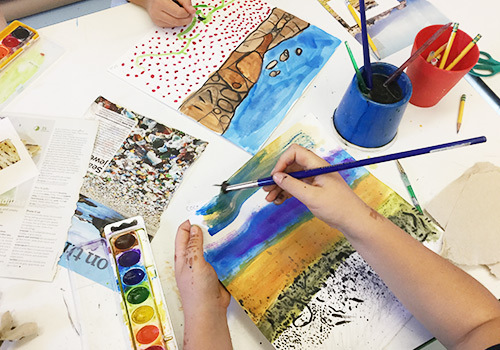 In Second Grade, we will paint landscapes looking at our beautiful campus, use memory writing from the homeroom for visual inspiration, study the artist and architect Hundertwasser, paint upside-down like Michelangelo, make pinch-pot and slab ceramics. Some of the media we will experiment with are crayon, tempera paint, printmaking, oil and chalk pastel, and watercolors. In Third Grade, we will draw flowers on campus like Georgia O’Keeffe, use Modigliani for self-portrait inspiration, use maps for collage, make pinch-pot, coil, and slab ceramics. Some of the media we will experiment with are colored pencil, tempera paint, printmaking, oil pastel, and watercolors. 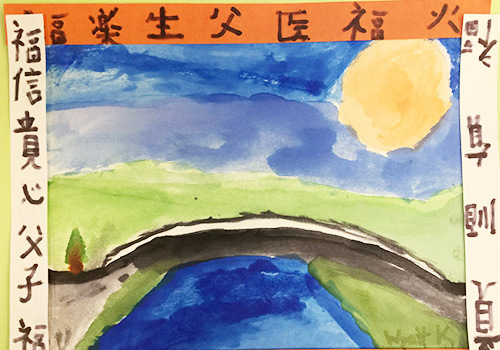 In Fourth Grade, we will explore color theory making monochromatic paintings and warm and cool paintings, try Japanese Sumi-e ink painting, study Egyptian art and hieroglyphics, create a Mission painting, make coil and slab ceramics. Some of the media we will experiment with are ink, tempera paint, printmaking, oil pastel, and watercolors. 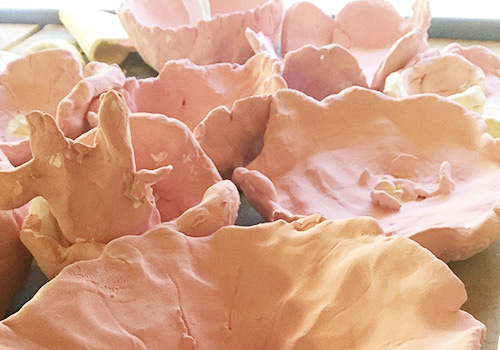 In Fifth Grade, we will draw still-life from observation, make European explorer maps, create abstract paintings and sculptures, use digital photography combined with drawing, make additive-subtractive and slab ceramics. Some of the media we will experiment with are acrylic and tempera paint, printmaking, chalk and oil pastel, colored pencil, and watercolors. Another purposeful part of the art program is the time, place, and community provided to the students for ‘play’ with art materials. This important opportunity allows kids to freely experiment and take their truly unique and individual ideas to stretch their minds. At SD, ecoliteracy is interwoven into all of our classes and curriculum. We believe that as educators we have a responsibility to teach students about interconnectedness, patterns, relationships, and the web of life, so that they have the tools needed to create a sustainable world. San Domenico addresses these critical issues in concrete ways throughout our curricula, policies, and campus practices. Learn more about Sustainability at San Domenico. The goal of technology at San Domenico is to equip students with skills that support and encourage lifelong learning in a global information society. The curriculum provides students with the skills necessary to present information, creative projects, and ideas to others. The objective is for students to use and integrate their knowledge into problem solving and understand that technology is a tool applicable to many settings. Learn more about technology at San Domenico. In the Lower School, we use the Digital Citizenship program developed and maintained by Common Sense Media. They designed an effective program to, "empower students to think critically, behave safely and participate responsibly in our digital world." Please visit their website to access a wealth of information for parents of children of all ages. Click here for the full Digital Citizenship scope and sequence and here to visit the home page of Common Sense Media.